The Lost City of Z is a 2016 American biographical adventure drama film written and directed by James Gray, based on the 2009 book of the same name by David Grann. It portrays real events surrounding the British explorer Percy Fawcett, who was sent to Brazil and made several attempts to find a supposed ancient lost city in the Amazon. 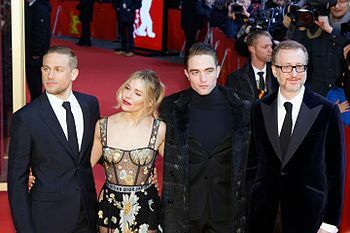 The film stars Charlie Hunnam as Fawcett; Robert Pattinson as his fellow explorer, Henry Costin, Sienna Miller as his wife, Nina Fawcett; and Tom Holland as his son Jack Fawcett. The film's world premiere was on October 15, 2016 as the closing-night selection at the New York Film Festival. It was released in the United States on April 14, 2017, by Amazon Studios and Bleecker Street. The Lost City of Z was praised by critics, though it grossed only $19 million against a $30 million budget. Despite this lack of financial success, Time magazine listed it as one of its Top 10 Films of 2017. Although "Z" is pronounced "zee" in the film's U.S.-made promotional videos (even by the British actors), it is pronounced "zed" by the characters in the film, as per British English. Ireland, 1905: Percy Fawcett is a young British officer participating in a stag hunt on an Irish baronial estate for the benefit of the visiting Archduke Franz Ferdinand of Austria. A skilled horseman and marksman, he brings down the stag swiftly but is snubbed at the after-hunt party. A year later, Fawcett is sent to London to meet with officials of the Royal Geographical Society (RGS). The governments of Bolivia and Brazil are nearly at war over the location of their mutual boundary and its direct effect on the region's extremely lucrative rubber trade, and have asked the British government to survey it. Fawcett agrees to lead the survey party to restore his family's good name. Aboard a ship to Brazil, Fawcett meets Corporal Henry Costin, who has knowledge of the Amazon rainforest. At a large rubber plantation in the jungle owned by the Portuguese nobleman Baron de Gondoris, the two meet Corporal Arthur Manley,[n 1] who tells them that the British government advises against further exploration. Fawcett, with several guides and the Amazonian scout Tadjui, completes the mission. Tadjui tells Fawcett stories about a jungle city covered in gold and full of people. Fawcett dismisses such stories as insane ravings, but discovers highly advanced broken pottery and some small stone statues in the jungle that convince him of the veracity of Tadjui's story. Fawcett is praised upon his return, where his wife, Nina, has given birth to their second son. In the Trinity College Library, Nina discovers a conquistador text which tells of a city deep in the Amazonian jungle. Fawcett meets the renowned biologist James Murray, who agrees to back Fawcett's expedition to the Amazon to find what Fawcett calls "the Lost City of Z". Fawcett attempts to convince the members of the RGS to back the expedition, but is publicly ridiculed. Nevertheless, the RGS backs the expedition to further exploration of the Amazon basin. Murray, unfamiliar with the rigors of the deep jungle, slows the party down significantly. Fawcett's party is attacked while traveling along the river. However, Fawcett makes peace with the natives. Murray suffers a leg injury which becomes severely infected, and begins to go mad. Fawcett sends him off with a native guide and the group's last pack animal to find aid. Fawcett's team are forced to abandon the expedition after discovering that Murray poured paraffin on their remaining supplies. Murray survives and, in front of the RGS trustees, accuses Fawcett of abandoning him in the jungle and demands an apology from him. Fawcett elects to resign from the society rather than apologize. World War I breaks out in Europe, and Fawcett goes to France to fight. Manley dies in the trenches at the Battle of the Somme, and Fawcett is temporarily blinded in a chlorine gas attack. Jack, Fawcett's eldest son—who had long accused Fawcett of abandoning the family—reconciles with his father as he recovers. In 1923, Fawcett is living in obscurity in England. North American interest in exploring the Amazon has reached fever pitch, primarily due to Fawcett's stories of the lost city. John D. Rockefeller Jr. and a consortium of US newspapers finance a new expedition by Fawcett. The RGS co-funds the expedition at the last moment to maintain British pride. Fawcett shows Sir John Scott Keltie a compass, informing Keltie that should he (Fawcett) find the lost city, the compass will be sent back to England. Fawcett and his son intend to go alone this time, traveling as light as they can for up to three years in order to find "Z". Fawcett invites Costin, but he declines. Fawcett and Jack are attacked by natives and escape, only to be ambushed again. This second tribe gives the Fawcetts a fair hearing, but are puzzled by them, noticing that their spirits aren't wholly of their own world but also not wholly of the Amazon. They declare that the spirits of the Fawcetts "must belong" somewhere and they will help them find their rightful place. Fawcett and Jack are drugged during a ceremony and carried away. Some years later, Nina Fawcett meets with Keltie, claiming she has heard that Fawcett and Jack are still alive and are living among tribespeople. The RGS, having sent more than a hundred people to search for Fawcett in the intervening years, declines to send another expedition. Keltie advises Nina to come to terms with her husband's death, but she refuses. Nina instead opens her purse, to give Keltie the compass Fawcett had promised to send were he to have found the lost city. "[David Lean, but with a] slightly more hallucinogenic feel, because [Fawcett] went to the jungle and sorta went mad. […] I hope it’s not my Fitzcarraldo." When I was sent the book in the fall of 2008, it hadn’t yet been published. I didn’t know what it was and I hadn’t heard of the story at all. It takes place outside of New York, and it’s a period piece in the United Kingdom and the jungle. So I had no idea why the people at Plan B decided to send me this book, because nothing in my prior work had shown that I could do anything like this. Maybe it was an act of madness on their part. In a 2015 interview with IndieWire, Gray admitted that he had developed the script for a while before moving toward production. He explained that the film was a "very complicated production and the story is amazing, but it's a complicated story. And you want to get it right. It's a very, very scary proposition to go into the jungle and all that. But at the same time it's terrific. It's why you make movies." The lead role underwent numerous casting changes. Brad Pitt was initially to star as Fawcett, additionally providing production duties through his company Plan B Entertainment. In November 2010, Pitt withdrew from the lead role due to scheduling conflicts, but remained attached as producer. On September 4, 2013, Benedict Cumberbatch came on board to portray Fawcett, along with Robert Pattinson, who joined the cast in the role of Costin. In February 2015, Cumberbatch dropped out also due to scheduling conflicts, and was replaced by Charlie Hunnam, while Sienna Miller was cast as Nina Fawcett. Principal photography began on August 19, 2015, in Belfast, Northern Ireland, and continued for five weeks until late September. On August 28, the production shot at Greyabbey Village and Strangford Lough in Northern Ireland. Hunnam and Miller filmed scenes at Ballintoy County Antrim on August 31, and further shooting took place at Craigavon House, East Belfast on September 2. Hunnam, Pattinson, Miller and Macfadyen shot scenes at Methodist College Belfast on September 3, 2015. On September 7, 2015, scenes were filmed at Belfast City Hall and on the grounds of Royal Belfast Academical Institution. Scenes were also shot at Bangor Castle Leisure Centre on September 13, 2015. Filming then moved to Santa Marta, Colombia, and continued through September and October. Christopher Spelman composed the film's musical score. He had previously composed the music for Gray's 2013 film The Immigrant, and had been arranger on The Yards (2000), We Own the Night (2007), and Two Lovers (2008). George Drakoulias and Randall Poster were music supervisors. The film's trailer featured "Tangled Earth" by audiomachine. The soundtrack was released digitally on March 24, 2017. The film had its world premiere as the closing night film on October 15, 2016, at the 54th New York Film Festival. Prior to that, StudioCanal acquired international distribution rights to the film, while Amazon Studios obtained U.S. distribution rights. Bleecker Street is partnering with Amazon on the film's theatrical release. The film was released in the United States on April 14, 2017. The film was released in France on March 15, 2017 and in the UK on March 24, 2017. In February 2017, the film was presented at the 67th Berlin International Film Festival in the Berlinale Special section. It also served as the opening night film of Boston International Film Festival on April 13, 2017. The film got a release date of June 2, 2017 in Mainland China, but was trimmed by 37 minutes, totaling 104 minutes. It is unclear if the move was due to a commercial decision, or a result of usual censorship by the State Administration of Press, Publication, Radio, Film and Television. The Lost City of Z grossed $8.6 million in the United States and Canada, and $10.7 million in other territories, for a worldwide total of $19.3 million, against a production budget of $30 million. The Lost City of Z was first released in France on March 15 where it generated $770,719 on its opening weekend. This was followed by the United Kingdom and Ireland on March 24, earning £270,139 from 282 theatres. It debuted at number seven on the box office chart. According to the review aggregator website Rotten Tomatoes, 86% of critics have given the film a positive review based on 229 reviews, with an average rating of 7.33/10. The site's critics consensus reads, "The Lost City of Z's stately pace and visual grandeur hearken back to classic exploration epics, and Charlie Hunnam turns in a masterful performance as its complex protagonist." At Metacritic, the film has a weighted average score of 78 out of 100 based on 44 critics, indicating "generally favorable reviews". Todd McCarthy of The Hollywood Reporter described the film as "a rare piece of contemporary classical cinema." Dan Callahan in his review for TheWrap said that "The Lost City of Z feels like a clear artistic advance for Gray, who proves himself here as one of our finest and most distinctive living filmmakers." Owen Gleiberman, writing for Variety, called the film "a finely crafted, elegantly shot, sharply sincere movie that is more absorbing than powerful." Joshua Rothkopf in his review for Time Out wrote that "the grandeur of this movie is off the charts..." Mark Kermode of Kermode and Mayo's Film Review stated that while the film had numerous flaws, such as ineffective elliptical storytelling and Hunnam's uncharismatic performance, "it is a film which is haunting me more than I thought.... it did feel like it was trying [to] break out of being just that narrative into something else". Explorer John Hemming criticized the movie's publicity for claiming that Fawcett was one of Britain's greatest explorers, arguing that this was an insult to the many true explorers, and that Fawcett was a racist, a "nutter", and a dangerous incompetent who "never discovered anything", but caused the loss of many lives. ^ a b His real name was Henry Manley, but he was renamed Arthur Manley in the movie, possibly to avoid confusion between him and Henry Costin. ^ "The Lost City of Z (2017)". AMC Theatres. Retrieved June 11, 2017. ^ Laurent Schenck (2017-03-15). "The Lost City of Z : 5 choses à savoir sur l'aventure amazonienne de James Gray" (in French). AlloCiné. Retrieved 2017-05-08. ^ a b "The Lost City of Z (2017)". Box Office Mojo. Retrieved July 22, 2018. ^ Fleming, Michael (December 9, 2009). "James Gray, Brad Pitt find 'Lost City'". Variety. Retrieved August 12, 2015. ^ Biello, David (August 28, 2008). "Ancient Amazon Actually Highly Urbanized". Scientific American. Retrieved February 1, 2017. ^ McNary, Dave (February 3, 2015). "Berlin: Charlie Hunnam Joins 'Lost City of Z'". Variety. Retrieved February 1, 2017. ^ Davis, Edward (December 27, 2014). "Sienna Miller Joins James Gray's 'Lost City Of Z,' Shooting May Happen Summer 2015". IndieWire. Retrieved February 1, 2017. ^ Erbland, Kate (August 3, 2016). "New York Film Festival Announces James Gray's 'The Lost City of Z' as Closing Night Selection". IndieWire. Retrieved February 1, 2017. ^ a b Nordine, Michael (September 1, 2016). "Amazon Studios Acquires James Gray's Rainforest Drama 'The Lost City of Z' Starring Charlie Hunnam". IndieWire. Retrieved October 14, 2016. ^ "Teaser Trailer from The Lost City of Z (2016)". IMDb. Retrieved 2019-02-05. 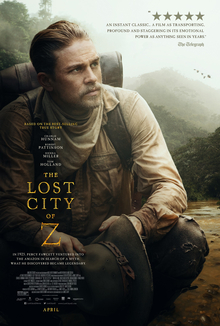 ^ "What Is 'The Lost City of Z'? from IMDb on the Scene (2015-)". IMDb. Retrieved 2019-02-05. ^ "86: The lost city of Z". basedonatruestorypodcast.com. Retrieved 11 March 2019. ...to help eliminate confusion between Henry Manley and Henry Costin. ^ Perez, Rodrigo (October 9, 2013). "James Gray May Direct Jeremy Renner's Steve McQueen Biopic; Calls 'Lost City Of Z' Epic & Hallucinogenic". IndieWire. Retrieved February 1, 2017. ^ McKittrick, Christopher (April 14, 2017). "Birth of an Obsession: The Lost City of Z". Creative Screenwriting. Retrieved April 17, 2017. ^ a b Jagernauth, Kevin (April 8, 2015). "Interview: James Gray Talks 'The Immigrant,' Diving Into TV With 'Red Road,' And His Own Favorite Films". IndieWire. Retrieved February 1, 2017. ^ Fleming, Michael (December 9, 2008). "James Gray, Brad Pitt find 'Lost City'". Variety. Retrieved August 12, 2015. ^ "James Gray To Direct Brad Pitt in The Lost City of Z". Retrieved August 12, 2015. ^ "Brad Pitt no longer starring in 'Lost City of Z.' Who should take his place?". Retrieved August 12, 2015. ^ "Benedict Cumberbatch in Negotiations to Star in James Gray's THE LOST CITY OF Z". Retrieved August 12, 2015. ^ Sneider, Jeff (July 10, 2014). "Robert Pattinson Joins Benedict Cumberbatch in James Gray's 'Lost City of Z'". The Wrap. Retrieved August 12, 2015. ^ "Robert Pattinson is so much more than Twilight, and his new film The Rover will prove it". Retrieved August 12, 2015. ^ "Charlie Hunnam Will Run Around the Amazon With Robert Pattinson in Lost City of Z". Retrieved August 12, 2015. ^ "Charlie Hunnam Replaces Benedict Cumberbatch in 'Lost City of Z'". Retrieved August 12, 2015. ^ "New Spider-Man Star Tom Holland Joins Charlie Hunnam in 'Lost City of Z'". Retrieved August 12, 2015. ^ "Tom Holland Joins 'Lost City Of Z'; ARC Acquires 'Garm Wars' From 'Ghost In The Shell' Helmer". Retrieved August 12, 2015. ^ "Brad Pitt sets pulses racing in sleepy Greyabbey village as filming picks up pace". Retrieved August 28, 2015. ^ "Charlie Hunnam films on set in Co Antrim". Archived from the original on September 1, 2015. Retrieved August 31, 2015. ^ "Hollywood 'A' listers filming in Ballintoy". Retrieved August 31, 2015. ^ "Brad Pitt movie The Lost City Of Z shoots scenes in East Belfast". Retrieved September 3, 2015. ^ "Sienna Miller wraps new red locks beneath questionable pink hairnet as she joins Charlie Hunnam and Robert Pattinson on The Lost City of Z set in Northern Ireland". Retrieved September 3, 2015. ^ "City Hall takes starring role in Brad Pitt film The Lost City of Z amid speculation star expected in Northern Ireland this week". Retrieved September 7, 2015. ^ "Bangor to become another Movie Destination - The Lost City of Z". Retrieved September 3, 2015. ^ "James Gray's 'The Lost City Of Z' Starts Shooting, Marvel's Spider-Man Tom Holland Joins The Cast". Retrieved August 12, 2015. ^ "Next Gen 2015: New Spider-Man Tom Holland on Jake Gyllenhaal, David Ayer and Why He Won't Leave London". Retrieved November 5, 2015. ^ a b "The Lost City of Z Soundtrack (2017)". Soundtrack.Net. Retrieved March 22, 2017. ^ "The Lost City of Z Soundtrack (2017) Credits". Soundtrack.Net. Retrieved March 22, 2017. ^ "The Lost City of Z - UK Trailer - Song / Music Info". Retrieved March 22, 2017. ^ "'The Lost City of Z' Soundtrack Details". Retrieved March 22, 2017. ^ Gregg Kilday (August 3, 2016). "James Gray's 'The Lost City of Z' to Close New York Film Festival". The Hollywood Reporter. Retrieved August 3, 2016. ^ Keslassy, Elsa (March 16, 2016). "Studiocanal Acquires Charlie Hunnam, Robert Pattinson's 'Lost City of Z' for Multiple Territories (EXCLUSIVE)". Variety. Retrieved March 17, 2016. ^ Busch, Anita (September 1, 2016). "Amazon Negotiating To Acquire Rights To 'Lost City Of Z'". Deadline Hollywood. Retrieved September 2, 2016. ^ Siegel, Tatiana (September 9, 2016). "Toronto: Charlie Hunnam Drama 'The Lost City of Z' Lands at Bleecker Street (Exclusive)". The Hollywood Reporter. Retrieved September 9, 2016. ^ "The Lost City of Z – Release Dates". Retrieved March 24, 2017. ^ "The Lost City of Z". Berlin International Film Festival. Retrieved February 11, 2017. ^ "Max Chicco, dal g-local di Torino a Hollywood e New York". Retrieved March 24, 2017. ^ Ryan, Fergus. "'Lost City of Z' Trims Runtime to Take on 'Wonder Woman'". China Film Insider. Retrieved 11 June 2017. ^ "The Lost City of Z (2017)". Box Office Mojo. Retrieved September 24, 2017. ^ Charles Gant (March 28, 2017). "Beauty and the Beast magic helps UK box office survive the spring sunshine". The Guardian. Retrieved March 29, 2017. ^ "The Lost City of Z (2017)". Rotten Tomatoes. Fandango. Retrieved April 16, 2019. ^ "The Lost City of Z Reviews". Metacritic. CBS Interactive. Retrieved May 21, 2017. ^ McCarthy, Todd (October 15, 2016). "'The Lost City of Z': NYFF Review". The Hollywood Reporter. Retrieved October 16, 2016. ^ Callahan, Dan (October 15, 2016). "'The Lost City of Z' NYFF Review: Charlie Hunnam Explores the Amazon in Stirring Saga". TheWrap. Retrieved February 1, 2017. ^ Gleiberman, Owen (February 1, 2017). "New York Film Review: 'The Lost City of Z'". Variety. Retrieved February 1, 2017. ^ "The Lost City of Z reviews Timeout". Retrieved March 24, 2017. ^ The Lost City of Z reviewed by Mark Kermode. YouTube. March 24, 2017. Retrieved April 8, 2017. ^ John Hemming (1 April 2017). "The Lost City of Z is a very long way from a true story — and I should know". The Spectator. Retrieved 11 March 2019. The new film The Lost City of Z is being advertised as based on the true story of one of Britain’s greatest explorers. .... Greatest explorer? Fawcett? He was a surveyor who never discovered anything, a nutter, a racist, and so incompetent that the only expedition he organised was a five-week disaster. Calling him one of our greatest explorers ... is an insult to the huge roster of true explorers. ... Fawcett casually remarked that five out of his six peons died from the effects of this five-week disaster. ... When one aimed a drawn bow at him, Fawcett shot the man with a Mauser revolver — absolutely forbidden by Brazil’s Indian Service. ... In 1925, ... Fawcett ... committed other blunders that antagonised their hosts. So it was only a matter of days before they were all dead. ^ Tartaglione, Nancy (December 19, 2017). "'Three Billboards' Leads London Critics' Circle Film Award Nominations". Deadline Hollywood. Retrieved December 20, 2017. ^ Anderson, Erik (December 9, 2017). "San Diego Film Critics Society Nominations: Dunkirk, Shape of Water Lead plus double mentions for Sally Hawkins". Awards Watch. ^ Anderson, Erik (December 11, 2017). "'Get Out' Wins San Diego Film Critics Best Pic; Sally Hawkins Ties Herself in Best Actress, James McAvoy is Best Actor". Awards Watch. ^ Lewis, Hilary (January 16, 2018). "'Disaster Artist,' 'Logan,' 'Wonder Woman' Among USC Scripter Award Finalists". The Hollywood Reporter. Retrieved January 16, 2018. This page was last edited on 16 April 2019, at 08:24 (UTC).